The cold January weather put none of the buyers off attending the first auction of 2017. There were 374 lots on offer and all were keenly viewed before the auction started. In the O gauge section there was an excellent range of ACE Trains. Highlights include this LNER grey 2509 ‘Silver Link’ A4 Class locomotive and tender which realised £826. And this LNET blue 4468 ‘Mallard’ A4 Class locomotive and tender which sold for £649. Also in the O gauge section this kit built electric KLS black 4-6-0 locomotive and tender sold for a whopping £1,150! Moving on to the OO gauge section this Hornby Dublo LNER olive green 2594 on bunker Class N2 0-6-2 tank locomotive No. EDL7 achieved £507. This Lawrence Scale Models professional Kit built and painted rake of 4 coaches realised £554. 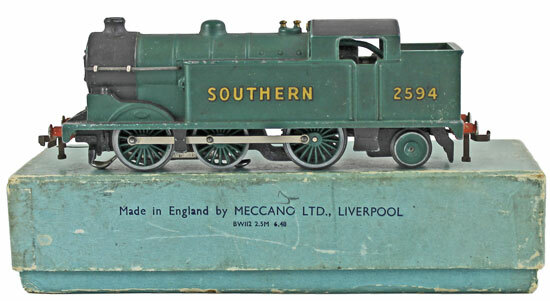 There was a good range of Wrenn locomotives in this auction. Highlights include this LMS 6146 ‘The Rifle Brigade’ Royal Scot Class 6P No.W2403 which achieved £259. This LMS 46231 ‘Duchess’ of Atholl Duchess 8P Class No.W2405 realised £283. And this LMS 6221 ‘Queen Elizabeth’ Coronation 8P Class No.W2301 sold for £460. Our next Model Railway auction will be held on Wednesday 15th March 2017. The full catalogue for this sale will be on our website in the next few weeks or keep an eye on our Twitter and Facebook pages which will include updates of our latest auction news.